Whether you’re a meticulous vacation planner or more carefree, you don’t want to be laissez-faire when it comes to leaving your home. No one wants to be enjoying a day at the beach and then have that feeling that something is amiss at home. 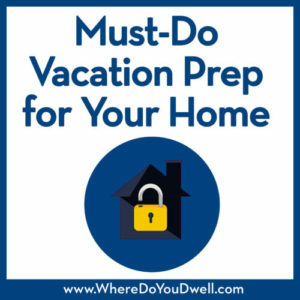 That’s why the pre-vacation prep of your home is a necessary step in your departure routine. Even if it’s a weekend jaunt rather than a week-long adventure, you need to make sure your home is safe and secure from burglars or hazards. Don’t wait for the last minute to handle these must-do items. Better yet, create a handy list for future reference so it becomes easier and easier each time. Don’t make your home seem desolate and empty while you’re gone. That’s a perfect invite for break-ins! Use timers on inside lamps and motion sensors to make it seem like someone is home. There also are “smart home” devices that you can do this remotely to change it up even more. Program a timer so that lights (and even your TV!) can go on each evening for several hours. Again, if you don’t want to go old school, check out “smart home” gadgets that you can manipulate remotely. Get outside motion-sensitive lights in the front and back yards to deter anyone from walking toward your home at night. Remember to always check if your bulbs are working before you leave! Ask a good neighbor to take out garbage and recycling bins on trash day. And have them return them the next day. You don’t want to stand out as the only home on the block without your trash containers out. Make arrangements to hire someone or have your usual yard service mow your lawn. And don’t forget to have your lawn and other plant containers watered. This is a must if you plan to be away for more than a week. Make sure storm drains are cleared of debris to prevent costly water damage. Don’t leave your driveway empty. Park your car in the driveway or ask a neighbor to park there if they have an extra car. It’s always good to let your nearby neighbors know you’ll be away. That way you’ve got someone keeping an eye on your home. Provide friends and neighbors with your contact information; and anyone they can call if there is an emergency. A trusted neighbor can look out for any delivered packages. Stop the regular mail or newspaper delivery if you can. Give a good friend or neighbor a key so that they can do a walk-through of your home, especially if you are gone for a while. They can water houseplants and double check to see if everything is okay. Burst water pipes can happen when no one is home to notice! There are certain things you need to do before you leave to prevent a fire, water damage, or any other hazard from happening. Shut off your main water valve so that you’ll prevent water damage if a pipe bursts. At the very least, you should shut off the water valves to your washing machine, dishwasher and sinks. Water damage is costly! Unplug small appliances and electronic devices. This includes toaster, coffee makers, TVs, modems, exercise machines, etc. Set your thermostat to a consistent temperature. You don’t want burst pipes in the winter or an overheated home in the summer. Aim for 60-65 degrees in the winter; and set 10 degrees lower than the outside temperature (76-80 degrees in DC area) in the summer to avoid mold and mildew forming. If you travel frequently, consider purchasing a wireless thermostat that can communicate with your smartphone to let you know if your home is getting too hot. Double check that all windows are locked and secured. Same with all doors, and remove any hidden outside keys. Adjust shades and certain curtains so no one can look inside your home, but at the same time doesn’t make your home look unlived in. Don’t leave wet laundry in the washing machine … you’ll be asking for mildew and mold! Empty all bedroom and bathroom trashcans. Do a sponge wipe of all countertops. Some final kitchen tasks – Remove perishable food from the fridge, take out the garbage to avoid a stench when you return, don’t leave dirty dishes in the dishwasher, and check that your garbage disposal is empty of scraps. Do a quick sweep of the floors for crumbs to avoid attracting ants and other critters. There are several options for those of you who want to go more high-tech when it comes to monitoring your home. Most devices can connect to your smartphone and keep you updated while on vacation and notify you if something isn’t right. You can get a smartlock that allows you to “unlock” your door from miles away. Or you’ll know when someone rings your doorbell or when the temperature rises. You can even get an indoor camera that detects motion or a front door camera. New gadgets come out every year and get easy and easy to use remotely, via an app on your smartphone. Carefully do the research on these “smart home” devices to see if they match your needs and budget. Hopefully you’re all prepared to leave your home. Have an awesome vacation!